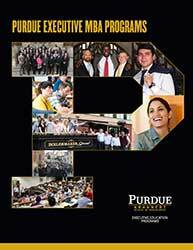 Our live, interactive webinars are a great opportunity to learn more about Purdue’s Executive MBA and the IMM Global EMBA programs. You can chat with executive education leadership and a program alumni or current student. Watch this short clip to preview our webinars. Log in to learn about our programs' structure, see what sets our executive education programs apart, initiate the application process, and get your questions answered. Note: Purdue University is on Eastern Time, the same time zone as New York City. To properly prepare for these webinars, please test WebEx prior to the event: http://www.webex.com/test-meeting.html. You may need to download an add-on to access WebEx. A wired internet connection is more reliable. Use this option over Wi-Fi when available. You may type in questions. Please do not use your webcam during the webinar. If you experience technical difficulties, contact Lisa Ratliff at the Krannert Computing Center at 765-494-7955 or kcc@purdue.edu before the day of the webinar, or at lratliff@purdue.edu the day of the webinar.